We, 3rd year Agribusiness Management students of Mindanao State University-Main Campus will be having our practicum this summer. We would like to apply in your prestigious company as practicum trainees because we believe that we will learn more of about our field of study that will equip us to be ready for the real business world. Sorry for the late reply. 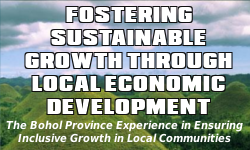 PPDO is a planning office, it would be appropriate if you will have your Practicum in the Office of the Provincial Agriculturist (OPA) or at the Office of the Provincial Veterinarian (OPV), as they have an Agribusiness Division in the office. You may address your letter request to Mr. Larry Pamugas, OIC, Office of the Provincial Agriculturist, Capitol Annex Bldg., Dao, Tagbilaran City or to Dr. Stella Marie Lapiz, DVM, Provincial Veterinarian, OPV, Capitol Annex Bldg., Tagbilaran City.